Now, in the UK, more and more people take part in the English Chinese GCSE (intermediate), A-level(advanced) grade exam. According to the overseas Chinese net, at present it has more than 120 Chinese schools in the UK, and more than 1500 Chinese teachers. The demand of Chinese learning is exuberant. And Britain's prime minister, has proposed"the number of people learning Chinese in Britain increased from 200000 to 400000 in 2020". According to media analysis, why learn Chinese is popular among British students and adults, one of the reasons is that China's investment in the UK enterprise and project is very much, to be able to fluently speak Chinese, has a great advantage in the competition. Language learning is always considered to be boring and difficult. But the MandarinGarden learning atmosphere is not the case, you will see different age and color of skin of foreigners show a happy smile. Not difficult endorsement, but in the interesting classroom like a duck to water. Role playing, games teaching, and our original no mediating language teaching and so on, all is innovative and efficient. MandarinGarden is full of Chinese style atmosphere, the festival Chinese knot, graceful and restrained maid pottery figurine, pristine bronze ware furnishing articles, and let you feel Chinese flavor on your face. That is why many foreigners would like to learn Chinese here. Here is the traditional cultural festivals, business etiquette and studies of Chinese ancient civilization, show the foreigners all kinds of traditional culture, and analyzes the method of Chinese behavior. 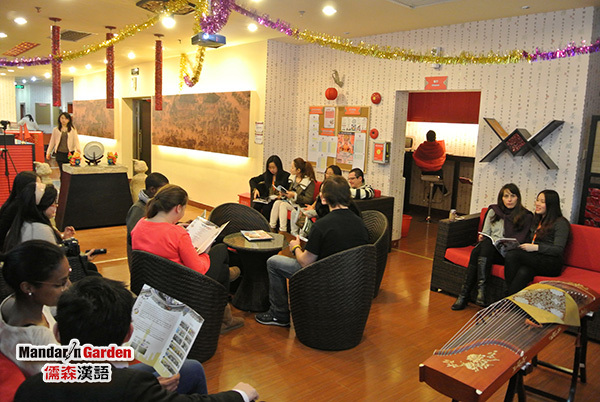 Students and business people,can fully experience the local conditions and customs of China.